Sushi is probably the most overrated food on the planet. Is it just for those who think they’re better than the rest, for example the couples who do yoga together and then like to talk to others about how great they are, or is that image a bit mean and outdated? For a while it was incredibly trendy to eat sushi but we’re sure those days are far behind us now so why bother? Well, taste is the first reason to eat sushi but that’s definitely an individual assessment so there’s no way that we can include that as a reason to eat it. It’s very quick to prepare and it’s very accessible nowadays (you can even buy ready-made packs for lunch time in supermarkets). Almost every ingredient that goes into sushi is full of health benefits. 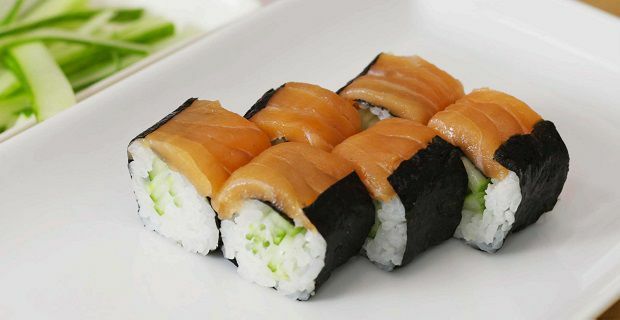 The raw fish you’re consuming when you eat sushi provides loads of omega-3 fatty acids which any nutritionist will tell you offers neurological and cardiovascular health benefits like lowering cholesterol and reducing high blood pressure. Sardines, mackerel, and salmon are normally consumed during a sushi meal and they’re all very high in omega-3 so you can change the fish content and still enjoy health benefits. Rice vinegar has antibacterial effects and it’s believed to lower your blood pressure, which might be why it’s a mainstay in a lot of other Japanese dishes. The ginger is used to cleanse your palate but it is known to help the body fight off cold viruses. A dish of soy sauce is customary with a sushi meal. It helps the raw fish go down well but it also has health benefits. It’s high in both iron and protein, and it also aids digestion. It’s also highly effective in killing colon bacillus.